21 Oct : Relatives of Indian pilgrims going for Haj will now be able to remain in contact with them as computers have been installed at various locations of the pilgrimage, External Affair Minister S M Krishna said on Tuesday. “Relatives sitting in India can now find out through the website of the Haj Committee of India the whereabouts of their relatives performing Haj and can communicate with them during their stay in Saudi Arabia,” he said during the flag off ceremony of the first batch of pilgrims at the Haj terminal of IGI airport. 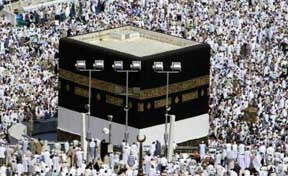 The first batch of around 200 Haj pilgrim left for the Holy Mosque in Saudi Arabia by an Air India flight on Tuesday. About 115,000 pilgrims would be going through the Haj Committee of India and rest 45,000 through private operators. They would be leaving for Haj from 19 embarkation points across the nation between 20th October to 20th November. Government has added Ranchi in Jharkhand and Mangalore in Karnataka as two new embarkation points for the convenience of pilgrims from these states. Krishna said that government has paid close attention to the arrangements made in India and Saudi Arabia to facilitate the pilgrimage. Krishna said the coverage of cash and baggage loss cases under Accident Compensation Scheme, which was introduced during Haj 2004, would continue and has been further expanded. He said the government has also taken adequate measures to address concerns arising out of spread of swine flu. “Our medical mission in Saudi Arabia has been fully geared up to address any health related requirement and will be working closely with the state health authorities.” Krishan assured the pilgrims that officials from the Indian Embassy in Riyadh and Consulate General of India in Jeddah could be approached in case of any difficulty during their stay in Saudi Arabia. “The government has deputed more than 600 administrative and medical staff for the help of pilgrims. The officials would be present in Jeddah, Makkah Mukarramah, Madina Munawwarah and also at centers established at Mina/Arafat during the entire Haj period,” he added.